Let’s face it – if you’re a true audiophile, you want perfect sound in all aspects of your life, from your headphones to your car and TV. And, when it comes to getting the best sound out of your home theater system, there is no better way to achieve this than an excellent pair of floor standing speakers. But, in our search for the perfect sound experience, we can easily go overboard and spend much more money than we originally intended. That’s why I created this list of the best floor standing speakers under $500 – to prove to you that you can get great sound without breaking your budget. Here are 9 tower speakers that you won’t regret buying. If you’re into audio gear, I think it’s safe to assume that you’re very familiar with Pioneer. This Japanese company has been one of the most popular players in the audio industry, and for a good reason – they have a wide range of products that can satisfy both the beginners and the more advanced users. The SP-FS52-LR is certainly intended for beginners, as it’s the most inexpensive entry on this list. However, this speaker performs well above its price. It provides a rich and natural sound, while the mid to high range is by far the best at this price range. Designed by the legendary Andrew Jones, these tower speakers work great even without a subwoofer. If you’re a fan of vinyl, you’ll be happy to learn that the SP-FS52-LR’s are as adept at playing vinyl as more expensive speakers on the market. Work great without a subwoofer. The most affordable entry on the list. Some users find its looks unappealing. The bass leaves a lot to be desired. Sporting black ash finish with silver drivers, the Polk Audio TSi400 speakers sound as impressive as they look. These speakers are compatible with amplifiers from 20 to 200 watts/channel, which will surely meet the needs of even the most passionate audiophiles. Their bass response is great, although it can be tricky to get it right from time to time. 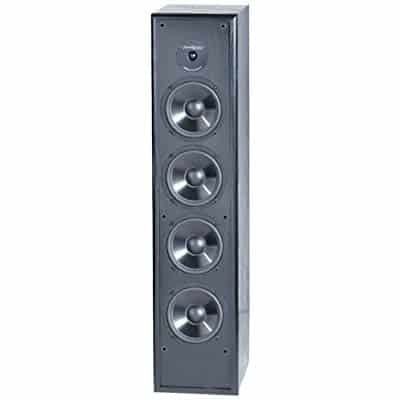 Although they are a step down from the top model in the TSi series (the TSi500), these speakers can make a small room shake. Just like with the Pioneer above, you don’t need a subwoofer to get the full sound of TSi400, although it will certainly help. The sound is great all across the frequency range, but it comes at a significant increase in price compared to the Pioneer pair. Still, if you want to experience the full power of a premium product without overspending, the TSi400 may be your best choice. A lot of power for this price range. Near full-range frequency response of 34Hz – 25kHz. Getting the right bass response can be tricky. Once you get to the higher frequencies, you can often hear the first signs of trouble with cheaper tower speakers. Not with the Yamaha NS-F210BL, though – these speakers handle higher frequencies with ease and deliver top-notch sound all across the frequency range. They are also very sturdy and sport a steel base that looks well-built and durable. 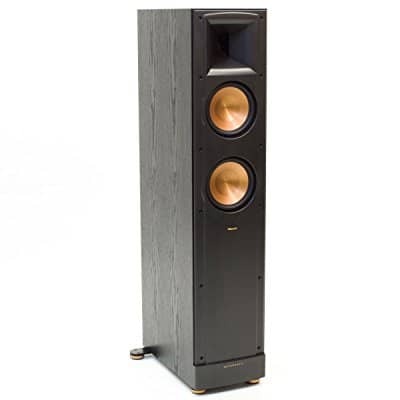 The bases are required to lend stability to these very slim floor standing speakers. One of my favorite things about these speakers is their looks. They have clearly been designed with home theatres in mind, as their slim black design will surely match any flat screen TV out there. The woofers use light aluminum cones that not only look good but also provide an extra fast response. If you find looks very important for your surround system, I recommend the NS-F210BL. They look very sleek and modern, and are specifically designed to match your TV. Good sound in the high frequencies. Gorgeous design that will match any flat screen TV. May not be powerful enough for some users. May require a subwoofer if you like bass. Klipsch has been a top name in the audio industry for a long time and it shows. The RF-62 II is able to recreate sound with minimum distortion and an impressively high level of detail in this price range. The dual 6.5″ high-output woofers make them stand out both visually and sonically. Known as the Cerametallic woofers, these copper-spun drivers are adept at handling a high amount of low frequencies at low distortion. They are also fitted with the titanium tweeters which can also be found in Klipsch’s flagship Palladium Series. The tweeters are horn-loaded to provide an open and natural top end. Although the high frequencies in these speakers are a true treat, they aren’t half as bad in the low range either. The high-output woofers are known for their great bass response. The horn-loaded tweeters are a Klipsch signature and what they are most well-known for. Great performance at high frequencies without fatigue. The horn-loaded titanium tweeter sounds open and natural. Attractive design with the two copper-spun drivers. Some people don’t find them powerful enough without a subwoofer. A well-known name in the entertainment industry, Sony has a lot of good audio products to show for. The SSCS3 speakers are definitely among these products, as they offer solid performance at a very affordable price. 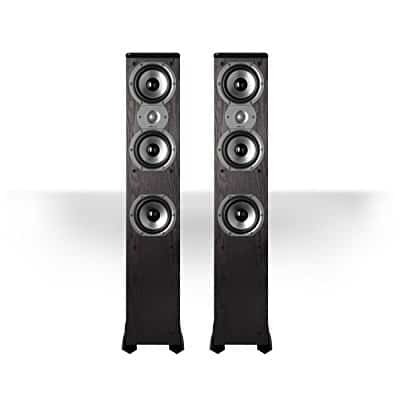 They may not be the most powerful on the list, but they are among the loudest tower speakers at this price range. They’re certainly loud enough for a great movie experience or for playing vinyl, especially in a small to mid-sized room. While the SSCS3 look pretty basic, the modern matte black finish may look appealing to some. They weigh well under 30 pounds, which makes them quite easy to move around but also easy to knock over if you have a pet or a small child. They do have a wide base that makes them more stable, but they still feel slightly less sturdy than you would like. Very powerful for this price range. Light and easy to carry around. Setup is very easy as they’re not picky about room placement. You may find them too light. The bass is nothing to get excited about. Sporting a similar design to the Sony SSCS3, the Onkyo SKF-4800’s do come at a slight increase in price. These speakers have an impressive bass response though it’s mostly mid-bass and upper bass, as it only goes down to 55Hz. The sound is natural across the frequency range (55Hz – 35kHz), and the highs are crisp and clear without any distortion. Their maximum power handling is at 130W, which is average for this price range, but the good bass response makes them sound slightly more powerful. The matte black finish also matches flat screen TVs, so you can rest assured that these will look sleek next to the screen. Solid mid-bass response that makes them sound more powerful than they actually are. Crisp highs with no distortion. They lack a bit of punch, but it should be enough for a small room. The base is narrow, so they can be easily pushed over. This intermediate-class speaker comes in with a set of four 5-1/4” drivers and one 1” dome tweeter. The quartet of woofer drivers has more than enough output for your average home theatre setting. Though they’re not subwoofers, they deliver decent bass and fantastic mids. The lone tweeter does a great job with the highs. These mighty Polks stand around 43-1/2” tall, 7” wide, and 15-1/2” deep. The cabinet is made of sturdy MDF (medium-density fiberboard) and is available in black and cherry finishes. The 3/4” thick front baffle and the internal bracing system guarantee a super clean tone. They look great with the grilles on or off. The Monitor 70 Series II can be matched with a wide variety of receivers and amplifiers, though it will certainly need plenty of power to get the best out of it. A definitive recommendation if you’re looking for a good price to performance ratio. B.I.C. America has been in business since 1973. Their Venturi series DV-84 is equipped with a pair of 8” woofers, two 8” passive radiators, and a 3/4” soft dome tweeter. The frequency response range is 27Hz to 22kHz, which is considered extended at this price range, and the sensitivity of 90db is about average. The recommended power for these beasts is between 10 and 250W for each channel. Needless to say, the DV84 delivers great performance across the board, providing excellent balance and crystal clarity. The 8” passive radiators extend the low frequency response. 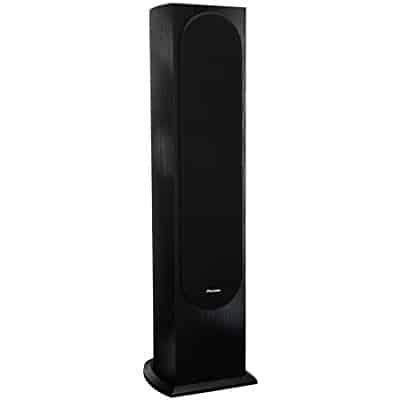 The DV-84 is a robust speaker, standing 48” tall, 10” wide, and 11-3/4” deep. Its cabinet is made of MDF and is available exclusively in black ash woodgrain finish. You can use this mighty B.I.C. 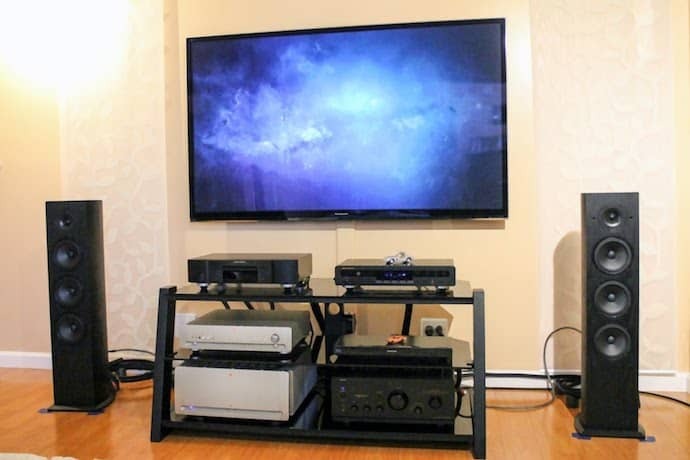 for both home theatres and music; it will not leave you stranded. The KF-28 is a part of Klipsch’s acclaimed Icon series and it’s been around since 2011. Overall, these speakers offer excellent bang for the buck. These mid-sized floor speakers are a two-way design with a pair of 8” woofers and a single 1” tweeter. The flush-mounted woofers feature lightweight diaphragms, while the famous Klipsch horn-loaded aluminum tweeter features linear travel suspension. The frequency response is 35Hz to 23kHz. It doesn’t go as low as some other models, but keep in mind that these measurements are done in an anechoic chamber. These speakers sound wonderful in a real-world living room. The sensitivity is very high at 98dB, so you can drive these speakers with pretty much anything (up to a peak power of 600W). The KF-28 rocks a modern design with a well-braced MDF cabinet. 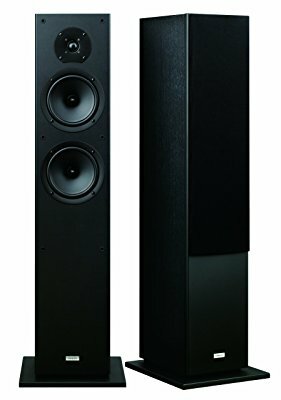 Each speaker stands 43.25” tall, 16” deep, and 9.5” wide. It is best used for home theaters, though it won’t leave you wanting in the music department. Since the audio market is so competitive, it can be easy to get lost in a sea of different options if you don’t know exactly what you’re looking for. Here are some important factors you should take into consideration when buying floor standing speakers. Bigger speakers usually pack more power, but you don’t want to go too big, as they won’t look pretty in a smaller room. Bookshelf speakers may be a more sensible option in that case. Also, you don’t want your speakers to tower over the TV too much. On the other hand, speakers that are too light can be easier to push over. Choose speakers that strike a perfect balance – small enough to look unassuming, but not too small that they can be pushed over. The frequency response denotes the range of frequencies that a speaker can reproduce. Since many affordable floor standing speakers struggle with lower frequencies, a good rule of thumb is that you will likely need a subwoofer if the low end is 50Hz or higher. Since your speakers will likely take up a lot of space and be at the focus of the room, you want to make sure they look nice. A dark wood finish fitted with woofers that stand out may be a good choice. Look to match the design of your speakers to your TV, as the last thing you want to have is a set of speakers that stand out from everything in the room. Basically, there are four main types of sound drivers you might come across – subwoofers, woofers, mid-range drivers, and tweeters. Usually, subwoofers are the biggest, with tweeters being the smallest. This is due to the frequencies they deal with. For example, a 20Hz low bass tone has a far longer sound wave than a 2KHz upper mid-range tone, and thus needs a bigger driver. Subwoofers are the biggest of the bunch, as they reproduce the lowest frequencies. Their typical range starts at 20Hz and ends at 200Hz, though they’re usually crossover-ed at about 80-120Hz. If a speaker has a subwoofer, it is most usually closest to the floor. Proximity to floor and walls can boost low bass. Woofers are the next type and typically they start as low as 40Hz and max out at 1KHz. Only the largest speakers can accommodate subwoofers. For regular music, woofers offer more than enough bass. Note that most modern music rarely extends below 40Hz. Contrary to popular belief, the thumping bass that we hear is actually mid-bass, closer to 100Hz than 40Hz. But if you listen to classical music with pipe organs, you may want a pair of speakers or a subwoofer that can hit 20Hz at loud volume. The third type is the mid-range driver. This driver usually deals with frequencies between 500Hz and 2kHz (human voice and musical instruments are also in that range). Usually, it sits between the woofer and the tweeter. It can be made of various materials, with each affecting the quality of the sound the driver produces. The fourth and the smallest driver is known as the tweeter. It handles the highest frequencies and is most commonly nestled at the top of the speaker’s cabinet. The tweeter’s typical range is between 2KHz and 30kHz, though human hearing tops out at 20kHz. Some tweeters can go as low as 1KHz, which is deep within the mid-range driver territory. Floor standing speakers vary greatly in size, depending on what they are intended for. Commonly, smaller speakers will have less drivers. Mind that this is not a hard and fast rule and that there are tall speakers with simple driver layouts. The most frequently used configurations are two-way, three-way, and four-way. The two-way setup, as its name suggests, features only two drivers. Usually, it is a woofer and a tweeter. The trouble with this setup is that the two have to split the mid-range duties, along with their designated roles. Bookshelf speakers often feature this configuration, while floor speakers can be two-way or three-way. On the other hand, a three-way setup comes with a woofer, a mid-range, and a tweeter. This way, the tweeter and the woofer are free to work exclusively in their natural ranges, leaving the mids to the mid-range driver. While largely similar to three-way setups, four-way setups feature either a super-tweeter driver or a subwoofer. Super-tweeters usually operate above the human hearing range. However, listening tests show that they can make the high frequencies sound airier and more three-dimensional. Floor speakers usually have wood cabinets. The most common option is MDF of varying thickness. 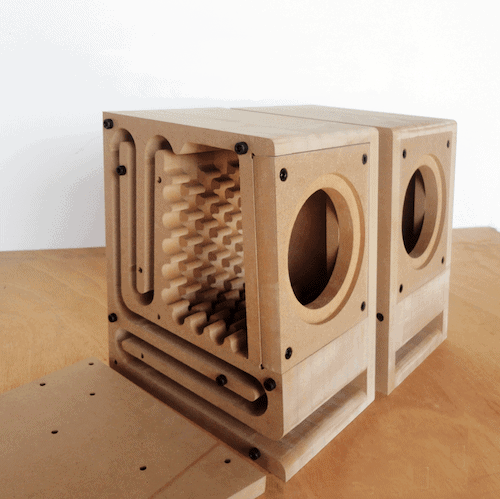 High-end speakers may use multiple layers of MDF up to 2 or 3 inches thick in total. Some feature exotic materials like proprietary polymers and metals. Woodgrain finishes are the most popular among the floor speaker owners. They look elegant and fit nicely with most living room furniture. On the other hand, you want your speakers to match the modern styling of your TV, then go for the black finish. So, there you go – the best floor standing speakers of my choice. Any of the speakers on this list will be a good option, but only you can know what you want to get out of your speakers. Think about the size of your TV or music room and choose the speakers that will give you the sound experience you’re looking for.